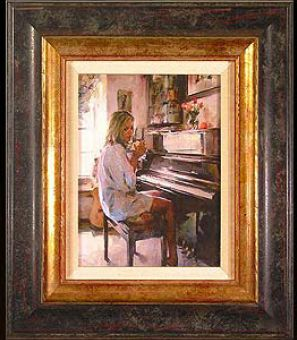 Michael & Inessa Garmash Handsigned and Numbered Framed Limited Edition Giclee on Canvas:"Morning Inspiration"
About the Artist:It all started in the little town of Lugansk in Ukraine, 1969. An early starter, Mr. Garmash began painting at the age of three. By age six he started his formal education at the Lugansk Youth Creative Center. Recognizing rare, natural talent, his teachers sent his works to a variety of exhibitions in the then Soviet Union. The Garmashs' publishing company, Collectors Editions, is a global art publishing company dedicated to providing the highest quality fine art and services available in the industry. Founded in 1986, they are also the exclusive global publisher of Disney Fine Art. Home to Eclipse Workshop, whose master printers are specialists in fusing traditional print-making with cutting-edge process, Collectors Editions is painting a better canvas for the art world�one brush stroke at a time.